I remember that jingle, "Open wide for Chunky." I remember eating"Chunky"Chocoate candy bars and they were great..I also remember the tv plugs that aired in the 1950's and 60's..especially the ones that first introduced me to a wonderful talent that I was lucky enough to meet in NYC years ago..Mr.Arnold Stang. It's the same as when soap and shampoo manufacturers introduced their 'contoured' containers: appealed to the eye but really meant to distract the consumer from the fact of reduced content. 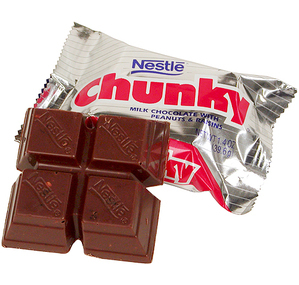 The original chunky was like everything else, much larger than it is today. It is now segmented in quadrants to conserve on actual weight even further. This is a YouTube link to an actual commercial from the mid '60s. I vaguely remember an "insect parts" scandal inside these.